Af ter my treatment for throat cancer, I was keen to try and get my life and physical being back on track. 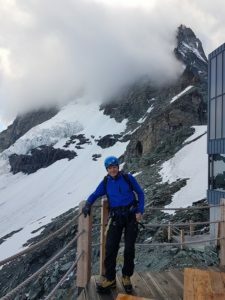 A combination of a chance phone call from a climbing friend and the help of “Challenge Cancer Through Adventure “, was the genesis of a plan to climb some iconic 4000m peaks in the Swiss alps. The adventure would require myself to train my weakened body back to being able to endure constant physical effort for several days. 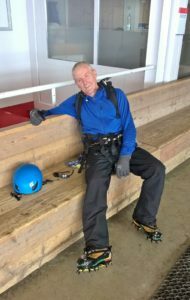 I flew to Switzerland and met my guide and friend Ady Nelhams in Leysin. 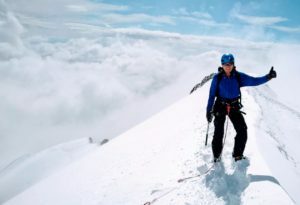 Leysin is the base for “international school of mountaineering”, which Ady is the director of. Day 1. 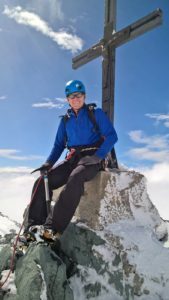 A four hour hike out of the Sass Valley to altitude at the Almageller Hurst 2 900m, for a quick lunch, before a 3hr ascent of the adjacent rock ridge of the Trifthorn (Dri Hornli). Day2. 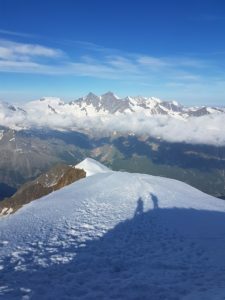 A 3am start for the ascent of the Weissmies at 4017m, with great conditions and lovely dawn views off the summit. 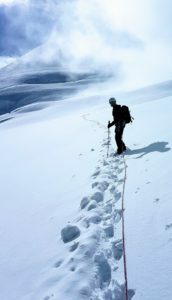 A long, quite dangerous at times, descent through unstable snow and crevases saw us get the lift to the valley. Day3. This saw us on our way to the Zermatt Valley and the long slog to the Hornli hut on the shoulder of the Matterhorn. The conditions deteriorated from nice weather to sleet as we settled into the hut, making the chances of an ascent unlikely. A clear weather window at 2am saw us on our way at a very fast pace. Four hours of broken loose rock, darkness and deteriorating weather later we had to make the decision to retreat. Ice build up was to great and a storm was closing in. We gained the hut and then down to the valley for lunchtime. Day 4. Quick drive back to the Sass Valkey saw us get the lift, then virtually run, to altitude at the Hohsaas hut at 3000m. A meal and four hours sleep and back out on the hill to summit the Laginhorn by 5am! A nice snow and mixed rock climb to a wind swept summit. A quick photo and back down to the hut for coffee and off to the valley. The rest of day 6 was spent eating and sorting wet smelly gear. The last day (7) and off to Saas Fee to get the lift up for a lovely easy ascent of the Allalinhorn at 4000m. Mixed gloom and sunshine saw us up the summit ridge, with the weather clearing just in time for great views across the alps. A slog through deep snow down to the lift station and a collapse on to the seats there, totally spent after a week of constant effort and sleep deprivation! Sport and adventure truly is a healing and strengthening endeavour.